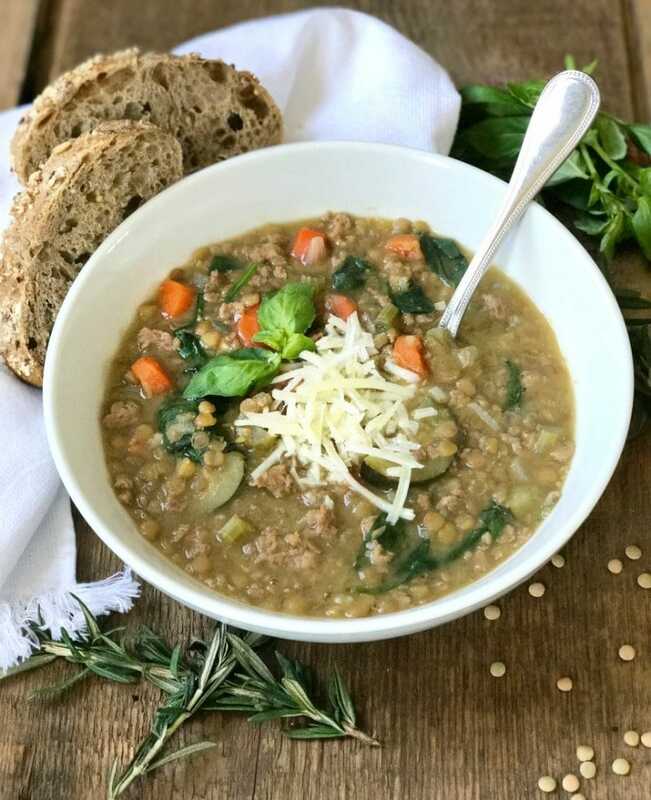 Packed with protein and veggies, this Instant Pot Sausage and Lentil Soup is delicious, 21 Day Fix approved, and totally filling thanks to a big, healthy portion size and some lean poultry sausage! This post contains affiliate links for products I’m obsessed with. This is a sponsored post on behalf of Bob’s Red Mill. As always, all opinions are 100% mine. Thank you for supporting the brands that help make Confessions of a Fit Foodie possible. 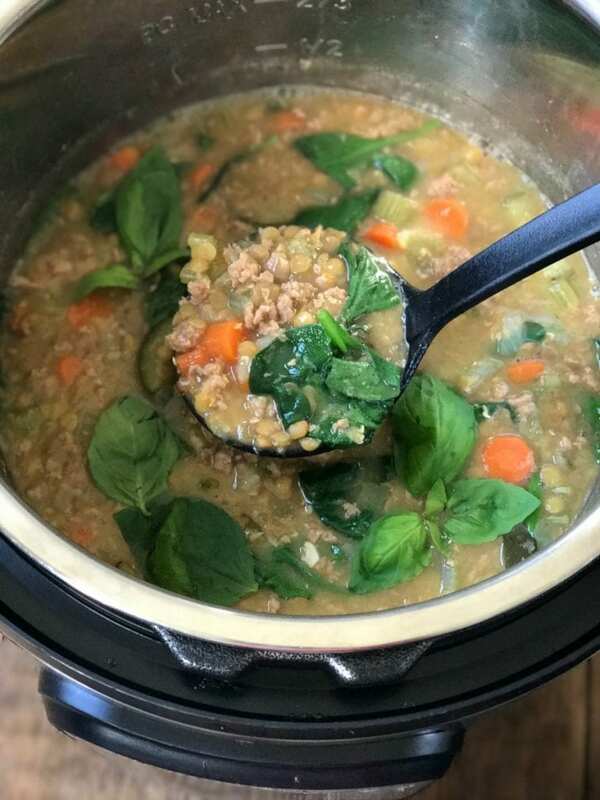 Confession #141 – One of the first meals I made as a teenager was lentil soup…and this involved me opening two cans of pre-made lentil soup and pouring them into a pot. In my defense, I would sauté garlic in olive oil and also add some cooked pasta in after I heated the soup. Oh, and I would top with fresh basil. So, really, when you are 16, I guess that counts as cooking. I continued to make this meal when my husband and I first got married, too, and it was a quick and easy favorite of ours. 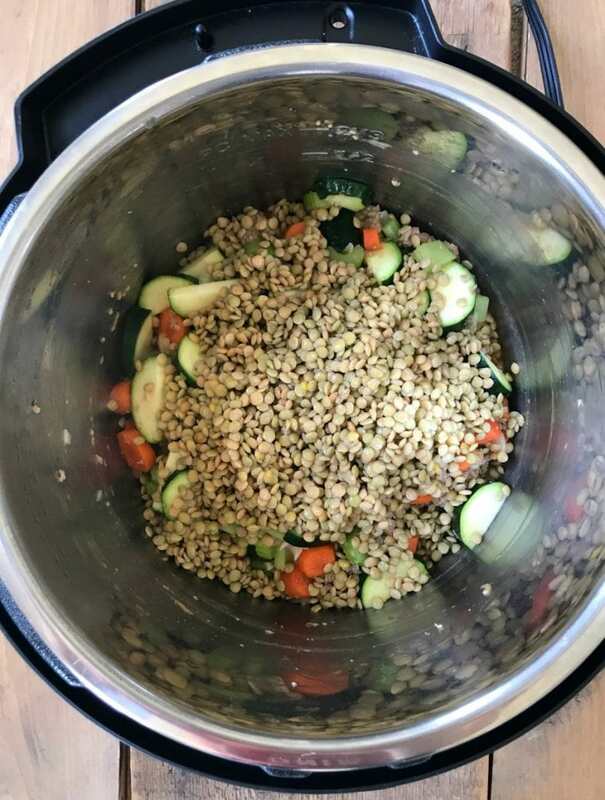 Obviously once I started the Fix, this recipe was a no go, but now, thanks to my Instant Pot, making lentil soup from dried lentils is crazy fast and so much healthier! 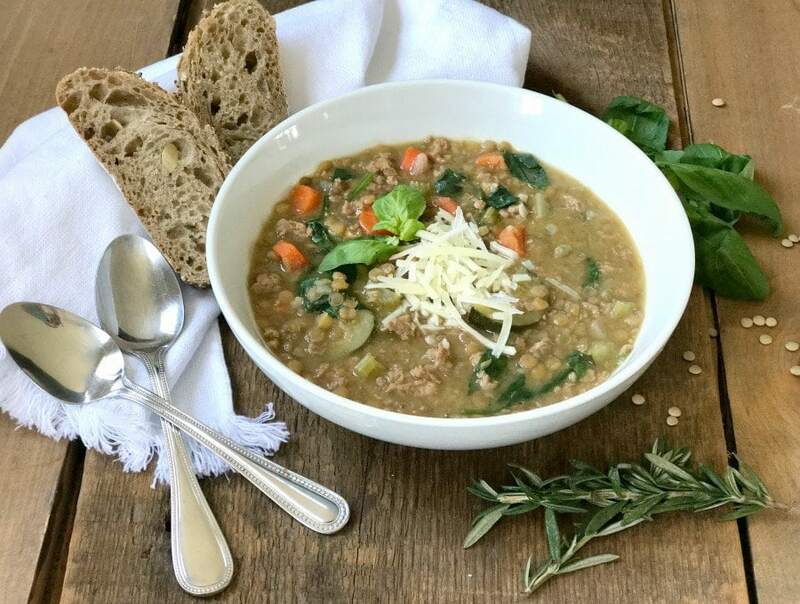 I used my favorite Bob’s Red Mill lentils for this. Did you know Bob’s made lentils? They actually have all kinds of delicious, high quality dried beans which are awesome to use in IP recipes. I added a ton of veggies to this because I love a big bowl of soup, but I don’t love parting with my precious containers, so gimme all the greens. 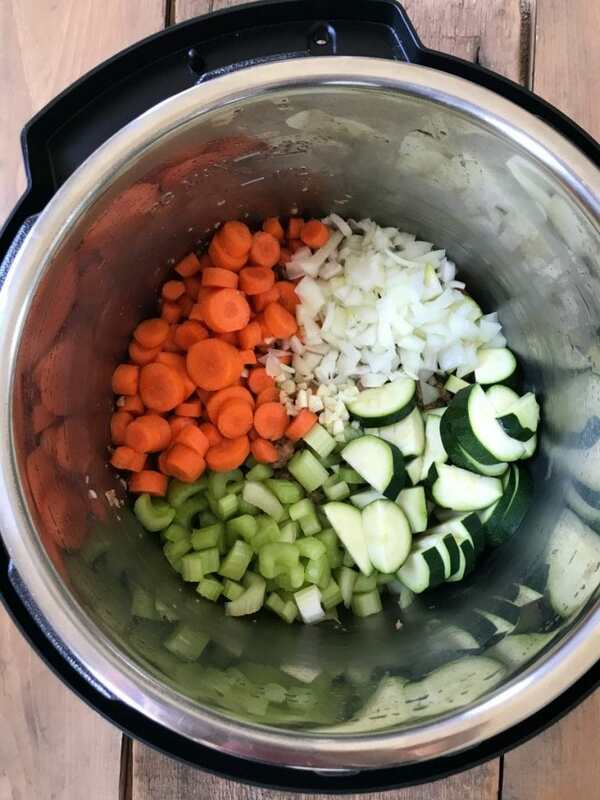 Twelve minutes on high pressure is all you need to cook this soup…total Instant Pot wizardry. And after a quick release, I added some spinach the pot for even more greens, and added in fresh basil. My mom loves rosemary with her lentils, but I am not a fan on rosemary with anything. You could also add parsley or oregano. YUM! Topping with fresh pecorino Romano is a MUST unless you are dairy free, but make sure you count your your blue container for this. I usually do a couple tablespoons on top. And you will not need any bread for this because it’s SO filling on it’s own…we are talking TWO cups per serving people…but I couldn’t resist it for the pic because my grandma loved a good loaf of Italian bread with just about everything. And that’s it! 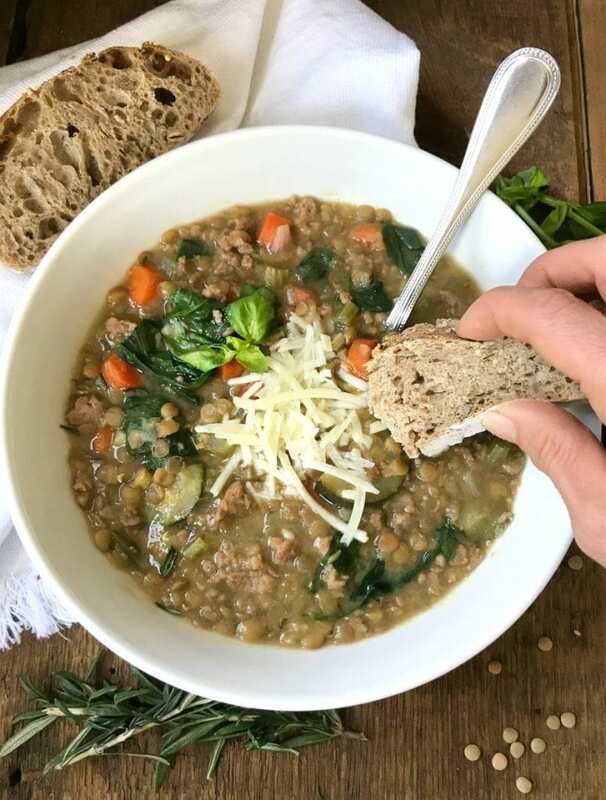 A perfectly delicious, yet healthy pot of comfort food for your dinner or prep ahead lunches from our favorite magical pot! Thank you Bob’s Red Mill for sponsoring this post. It means so much to me to work with brands that I love and use in my kitchen daily! 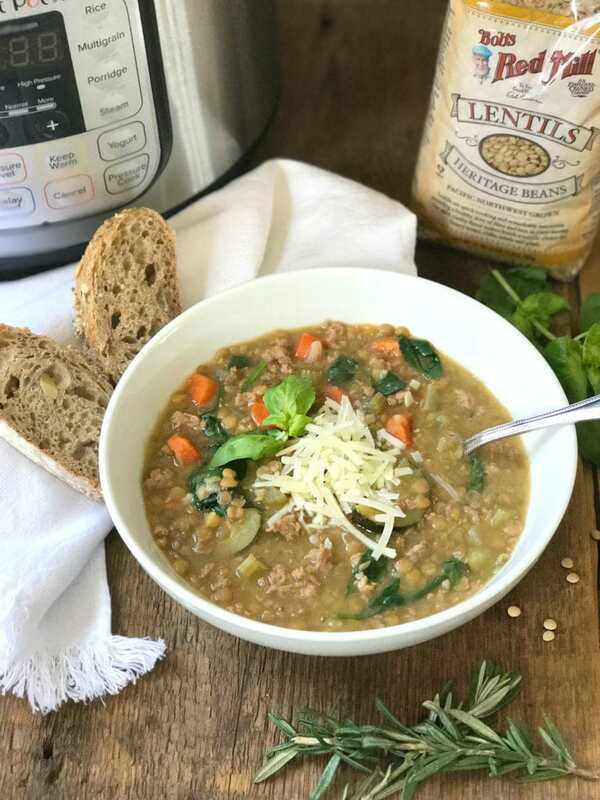 Packed with protein and veggies, this Instant Pot Sausage and Lentil Soup is delicious, 21 Day Fix approved, and totally filling thanks to a big, healthy portion size and some lean poultry sausage! Set your Instant Pot to sauté and heat olive oil. Remove sausage from casing and brown until cooked through. Add in onion, celery, carrots, and garlic and sauté until fragrant. Add zucchini and sauté another minute. Pour in lentils and chicken stock and give everything a good stir. Place lid on your IP and lock, setting for 12 minutes on manual. After cook time, do a quick release. Remove lid after the Instant Pot beeps and unlocks. Stir in spinach leaves until they wilt. Add in fresh basil to taste and salt and crushed red pepper, if desired. I find that salt isn’t needed due to the stock and the sausage, but if using sweet sausage, some crushed red pepper tastes great! Serve with Pecorino Romano (measured in your blue container) and enjoy! For STOVETOP – Heat olive oil in a large soup pot. Add in turkey sausage and brown until cooked through. Add in onions, carrots, and celery and cook until veggies are soft. Add garlic and zucchini and cook for an additional minute or two. Stir in stock and lentils, cover and bring to a boil. 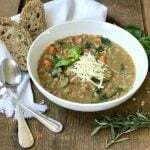 Reduce heat to a low simmer and cook for 35 minutes or until lentils are soft. Add in spinach and herbs/seasonings. Serve with Pecorino Romano. This makes 12 cups of soup and serves 6. Serving size is 2 cups. Each serving is 1 1/3 GREEN, 3/4 RED, 1 YELLOW, 1/3 tsp. If you are using cheese, be sure to measure your blue. Is there a stove top version ?! 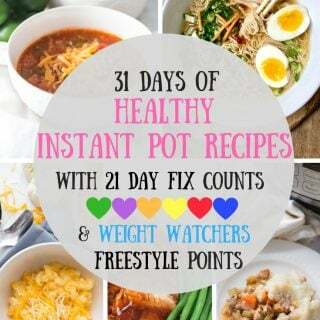 This looks amazing but I don’t have an instant pot ! Thanks , can’t wait to try it ! Also obsessed with Bob’s Red Mill! Right? Everything they make is amazing! Hi Mindy! That’s awesome to hear! I miss you, girlfriend! I recently found your site, I am a Beachbody Coach and I’m doing the 80 Day Obsession, I can’t tell you how easy and versatile your site is and how everything I find and make is AMAZING!!! I don’t know how you do all this but I am THANKFUL for you and your amazing recipes!!!! I ended up making this today and it was amazing! I did substitute low sodium beef broth because that’s what I had on and it was really good ! I just made this and I am OBSESSED!!!!!!!!!! Just confirming that 2 cups of the soup only equals 1 yellow???? I just portioned out two cups and it’s an amazingly generous portion. I’d love if it really were just one yellow (doing 21df, not 80DO). Thanks! I am SO grateful to find your blog. I have done 21DF before, but in a much needed reset. So with 80 Day Obsession starting last week, your recipes help. I LOVE cooking. This feels manageable knowing the recipe possibilities are unlimited. TY! 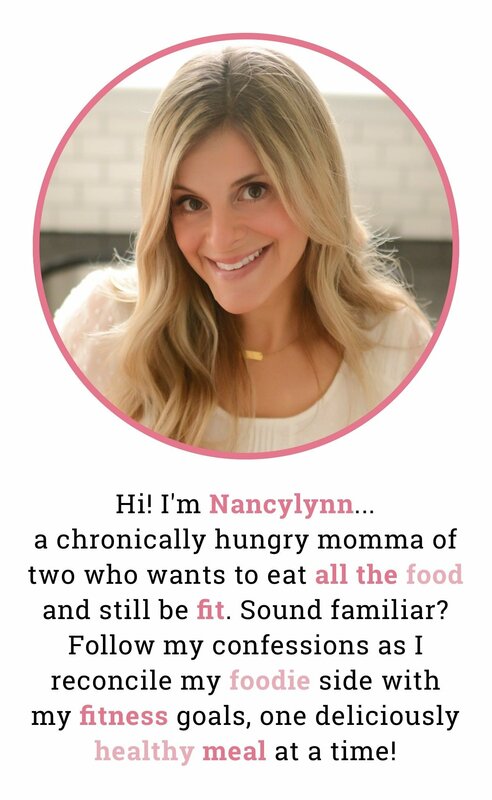 Love your recipes – my go-to site for yummy and healthy/21DFX/80DO freindly! 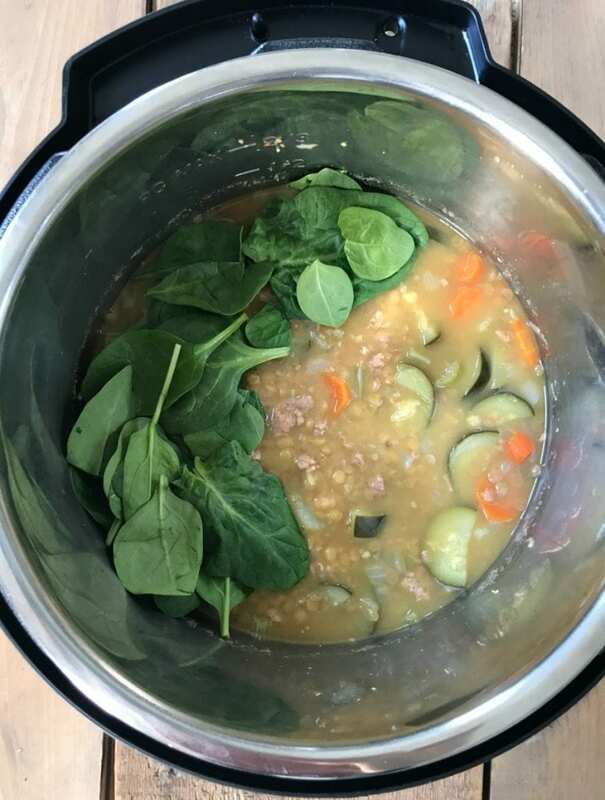 Made this soup last night in my Instant Pot while Krispie Chicken was baking in the oven. 2 dinners done at one time. 🙂 Actually eating a bowl right now for lunch! 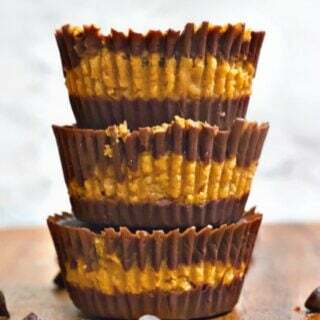 This recipe is so delicious and even easier to make! Will definitely be adding this into my rotation. Even my husband who is a super picky-eater liked it! That’s fantastic, Courtney!! Thank you for sharing!! 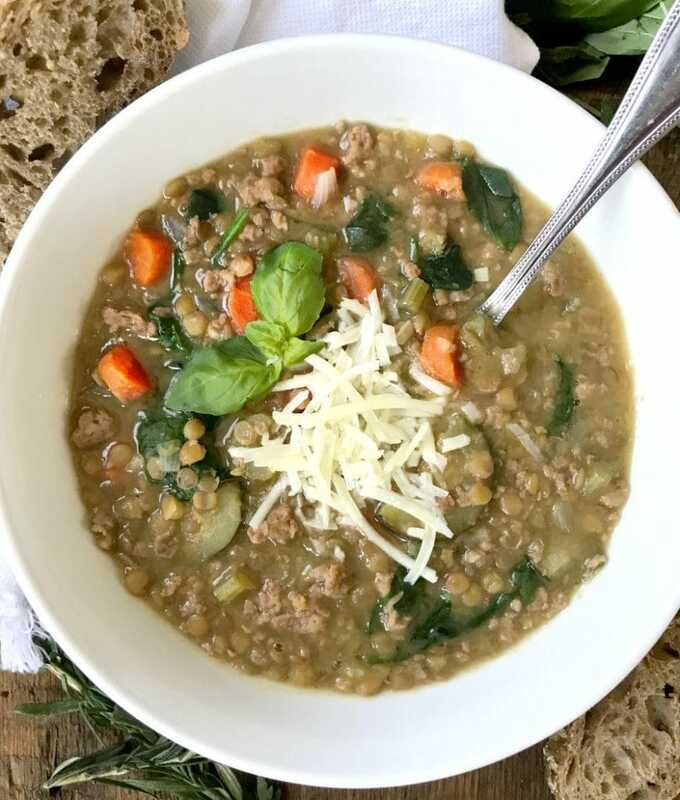 If I use canned lentils how should I adjust the broth? I would add it one cup at a time to your desired thickness! And you can reduce the time quite a bit, too! 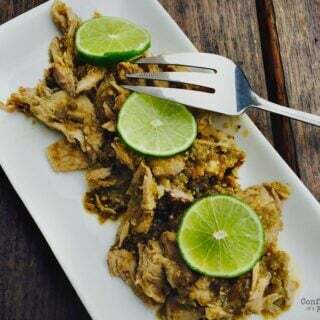 Are the calories available for this recipe? You can use myfitnesspal.com to help with this!! What’s the container counts for this soup on 21df? Thank you for leaving a link to your page in the IP page! 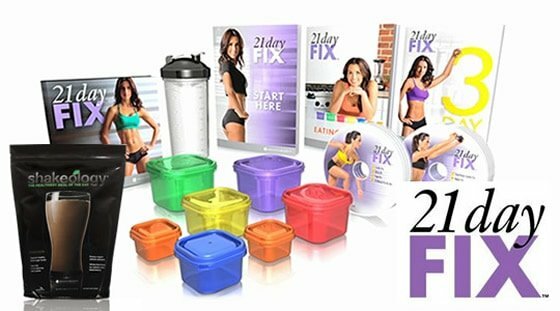 Just got mine and it’s been a struggle to find healthy recipes that look like something my husband will eat – AND you’ve got 21 Day Fix measures alreadedy included!!! Double win! I’ve never made lentils but bought them and they’ve been in the cupboard a year! This recipe sounds fabulous and I think my hubby will like it because of the sausage. Are red lentils okay for this? They are!! 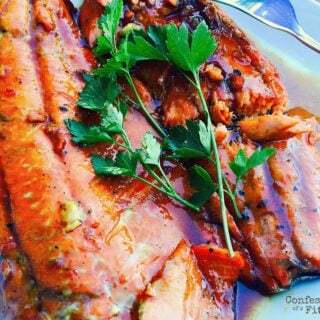 This is one of my favorite meals – I hope you guys love it, too!